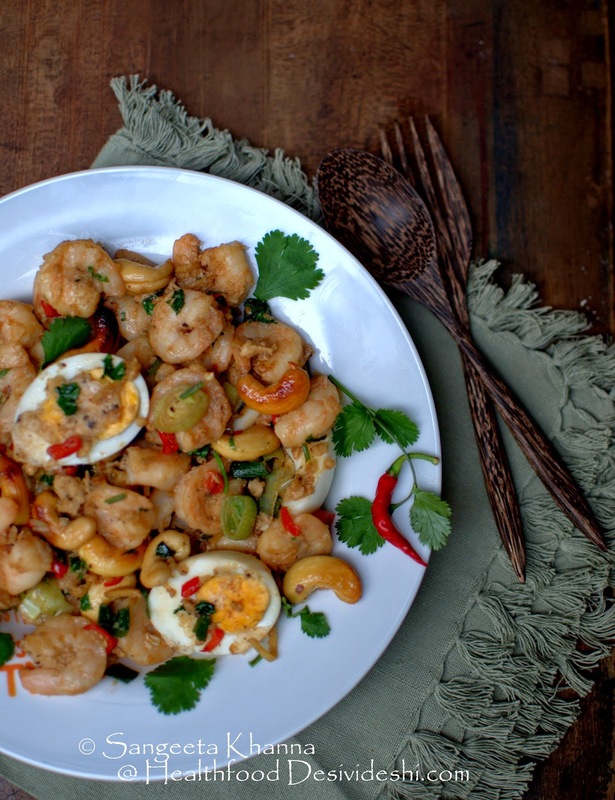 I keep cooking my simple versions of Kung Pao Prawns quite frequently. Sometimes I make variations and add some shredded chicken or boiled eggs to the same stir fry. I have posted one Kung Pao style prawns stir fry with boiled pearl barley which is a yummy one dish meal. I love the way fried cashew and red chillies compliment Oriental flavours in this kind of stir fry. Kung pao style stir fry can be made to be served as a starter or as a main course with necessary changes in seasoning if required. I like it without a clinging sauce, generous hint of ginger and star anise and a little hot and smoky. Fried dry red chilly do the job well to bring a hint of heat and smokiness. 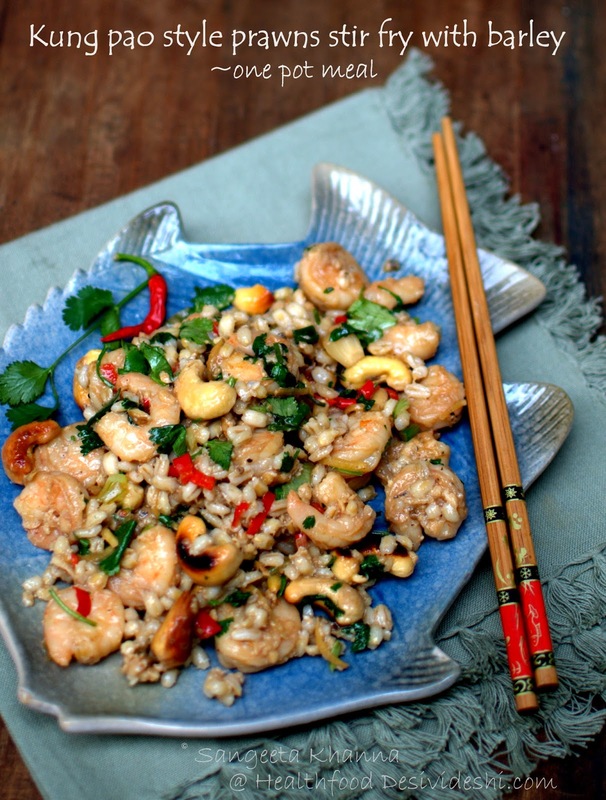 With added pearl barley this version of kung pao prawns is one of my favourite meals. 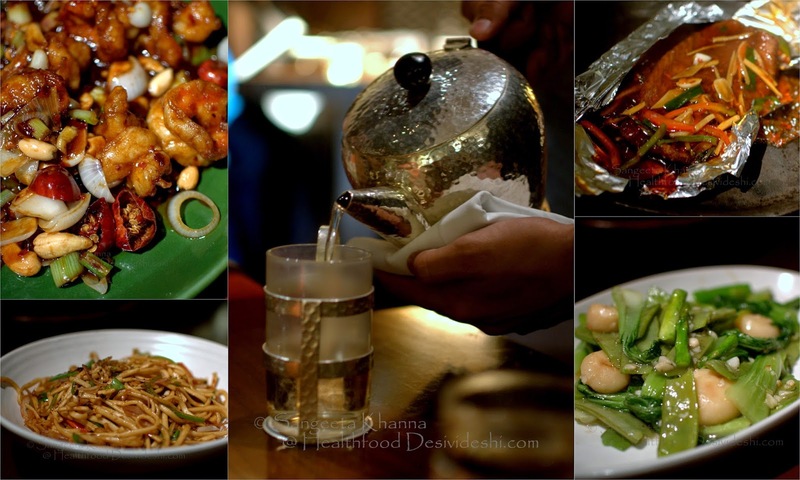 We recently had a yummy Kung Pao prawns at The China Kitchen, Hyatt Regency here in Delhi. We were there to get a taste of the brand new menu launch they did recently and I must say we had a blast. 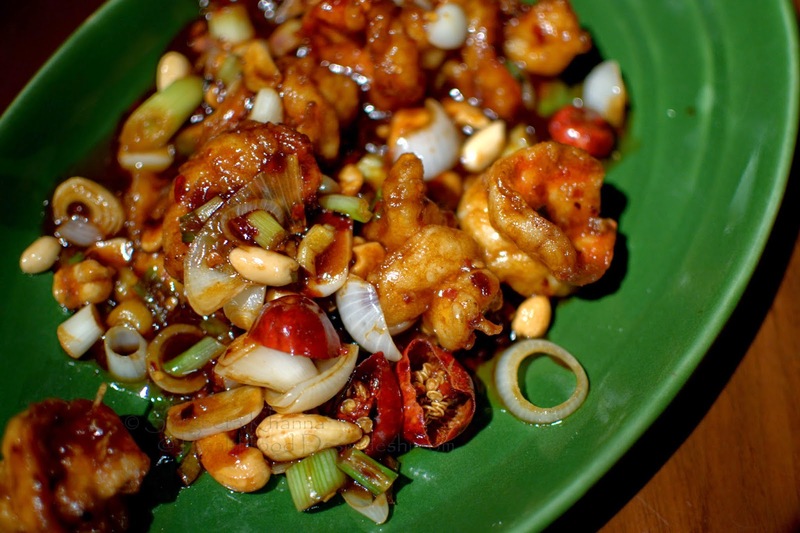 This kung pao prawns at The China Kitchen was a saucy version of Kung pao prawns with roasted peanuts and cashew. Plump prawns and rings of spring onion this could be my entire meal of the day. But we tasted and ate a lot of good food that day. 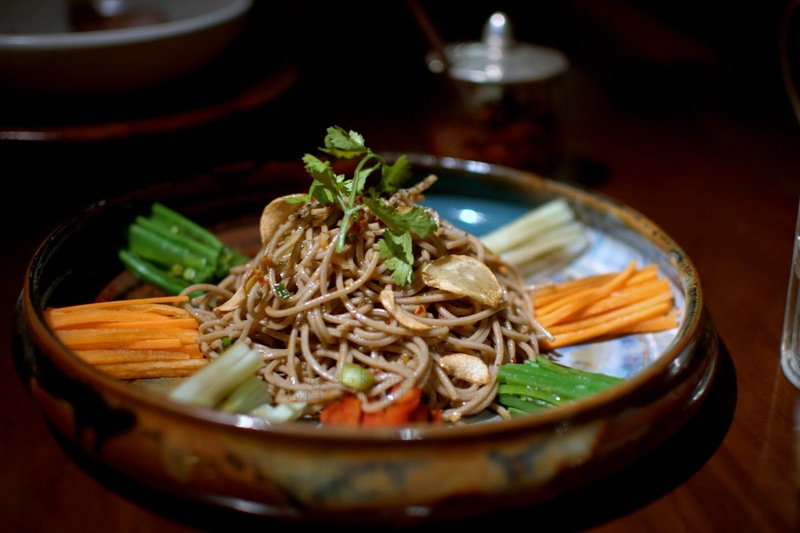 I loved the Buckwheat noodles tossed with red chilly flakes and garlic flakes. The tofu and cheese stuffed puff pastry was nicely done, good looking and decadent. 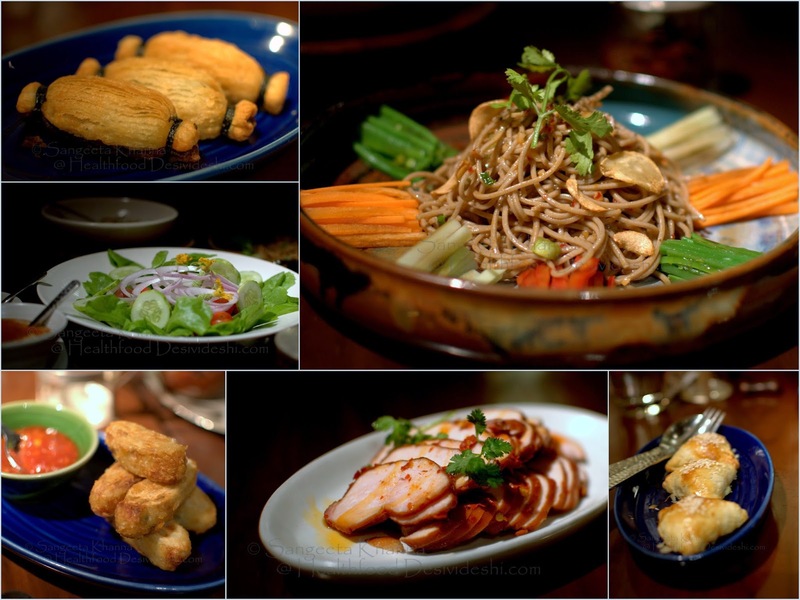 An interesting lotus stem fritters was ordered and I found it really good. Two broad oval slices of lotus stem sandwiched a filling of mashed potatoes and some vegetables and deep fried like tempura, it can be a nice party appetiser. Arvind liked the smoked chicken salad with hot and sour glaze. It was really well done but I would have liked it a little bit moist. I wont mind tossing this salad up with loads of greens for a meal. And there were enough green salads on the menu. In the main course we both loved the Pomfret papillote, done in aluminium foil and served on a sizzler plate. Very well done I must say. I liked the crusty skin of pomfret though it must have been grilled before steaming it in the foil coverage. The result was good, flaky fish with crusty skin with a flavourful sauce. A vegetables stir fry with snow peas, water chestnuts, asparagus and broccoli etc was really nice too. Very subtle flavours and the right amount of garlic for us. All accompanied with a small serving of udon noodles. 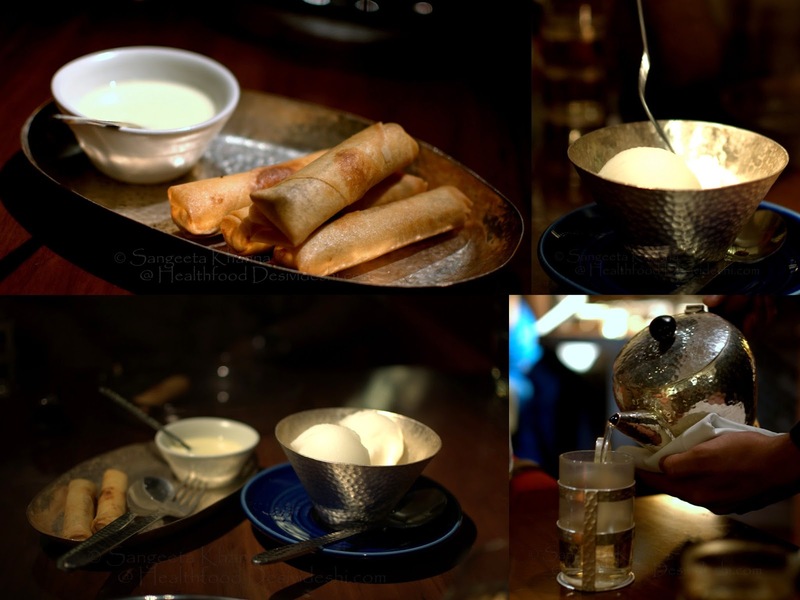 All washed down with sips of Jasmine tea. A banana and chocolate spring roll was recommended for desserts. It came with a vanilla sauce. Nice flavours and textures but this was not my kind of dessert. The lime sorbet was more my kinda dessert. I am not too 'frozen dessert' types but citrus sorbets are different. Loved it absolutely. I am making a citrus sorbet very soon. This is the time for it. Long time I made any frozen desserts. I am doing it one of these days for sure. 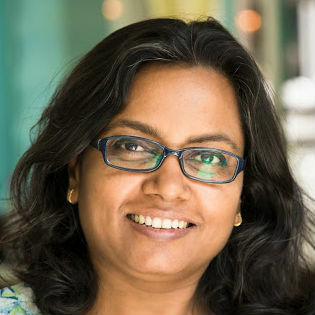 And will click pictures too so it comes here on the blog.